DM24 and CD24 digitisers have a 1kb memory region which can be used to store information about attached sensors and the digitisers themselves. Users are free to store any data they wish in the digitiser’s information block. Typically, this is used to store calibration parameters, poles and zeroes, etc. Newer digital sensors have their calibration information pre-loaded into the information block. DM24mk3 instruments use this information to perform their strong motion calculations. The format of information blocks is described here. Digitisers automatically transmit the information block, if it is set, at every reboot. The block is transmitted with a special stream ID ending IB. There is also a terminal command which triggers transmission of the information in the block. Typing SENDINFO causes the information block to be retransmitted as a GCF block after the terminal session closes. Depending on the filing mode, the block will either be transmitted over the serial port or stored to flash. First, you must prepare a file on your computer containing the relevant data, possibly using the format described here. 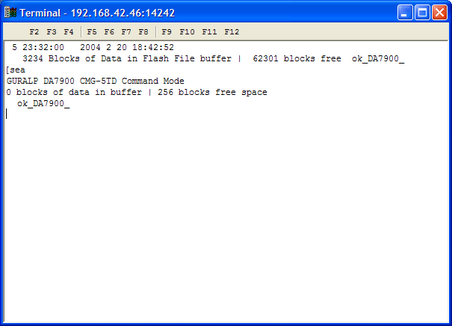 The file must not be larger than 1000 bytes (it must fit inside a GCF block). If you use a EAM or any equipment with an integrated EAM (such as a DM24SxEAM or an instrument such as a 5TDE) you can load the InfoBlock using the digitiser configuration dialogue. This is the simplest way to load an InfoBlock. If you do not have access to an EAM, follow the procedure below. To change the content of the digitiser’s information block, follow the steps applicable to your sensor type. Note: Loading InfoBlocks takes place in the bootloader environment, which does not properly support 230,400 Baud operation. If Port 0 is set to 230,400 Baud, reduce the line speed to at most 115,200 Baud before proceeding. Both ends of the serial link need to run at the same speed so you may also have to reconfigure Scream or your terminal emulator. Connect to the digitiser terminal using Scream!. Right-click on the digitiser’s icon in the main window and select Terminal from the pop-up menu. Check that there is two-way communication with the digitiser by pressing return. The digitiser should reply with ok on a new line. Copyright (c) 2002-3  GSL, EDSL & MicroProcessor Engineering Ltd.
Press I. The digitiser will then request a transfer. A file browser window will open automatically. Navigate through the directories on your computer and select the file to be uploaded, or type in its full path and file name. Click Open. Whilst the file is being uploaded, a progress window will be displayed. A 6 channel digitiser (DM24S6) actually has two info blocks. The first holds information that applies to the Sensor A instrument, and the second holds information for Sensor B. After uploading the first block, the DM24 will ask if you wish to upload the second infoblock. Once the files are fully transferred, the digitiser will return to its maintenance menu. Press return to reboot the digitiser with the new information block. Convert the prepared file to Intel HEX format. An on-line tool for performing this conversion is available at www.guralp.com/apps/txt2hex.html and other tools are freely available from the Internet. Enable the extended dictionary with the ok-1 command. Enter the command load-i . Right-click in the window and select Send File…. Browse your local directories to the location of the new file, and click OK.If the transfer fails to start, the upload may have timed out. Repeat steps 5 and 6. 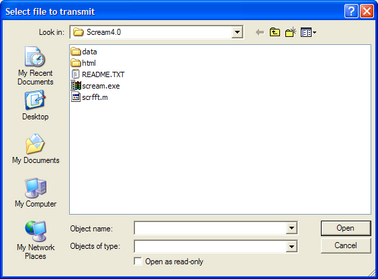 A window will appear showing details of the file transfer. When it is finished, the digitiser should display Info Block.... Saved. Check that the new information block is successfully loaded by issuing the command .info (which is only implemented in the latest firmware).